The National Center for Hydro Meteorological Forecasting yesterday said a cold wave is affecting the north and northern mountainous provinces. On October 27, the temperature is expected to drop to 20 to 23 degrees Celsius in several provinces of the north. Many areas in the northern and north central region experience rains to heavy rains due to the impacts of the east west monsoon. Last night, the provinces from Nghe An to Binh Dinh experienced heavy rains. From October 29 to 30, the temperature in north will continue to drop sharply while the temperature in the southern region keeps normal with scattered rains and thunderstorms. HCMC sees highest temperature at 33 ro 34 degree Celsius however it can be hit by torrential rains in the evening. The center warned tyhoon Yutu is developing quickly in the east part of the Philippines and forecast to develop into a super typhoon. Japanese Meteorological Agency said the typhoon was measured at 17.1 degrees north latitude, 138.25 degrees east longitude at speed 20km per hour and moving westwards yesterday. 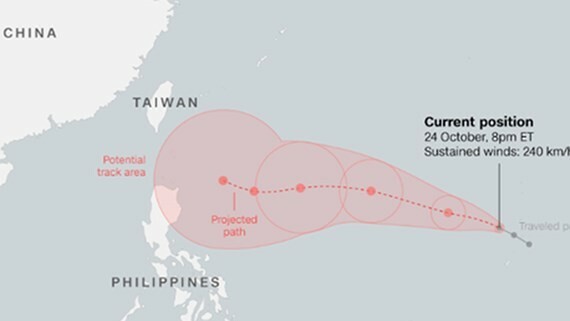 Asian Pacific centers forecast Yutu typhoon will be able to enter the East Sea in the next week.